Things are believed to be moving quite fast between Ranbir Kapoor and his ladylove Alia Bhatt. While Alia has been welcomed warmly in the Kapoor clan, Ranbir has fit in with the Bhatt family too. 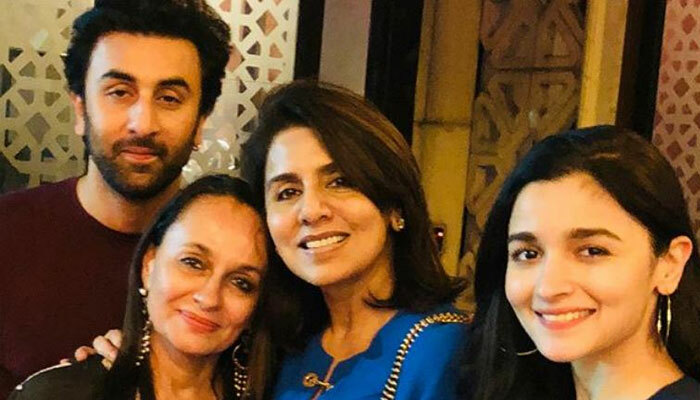 Alia in fact is loved so much by Ranbir Kapoor’s parents Rishi and Neetu Kapoor, that she is often clicked while at dinners with them. Ranbir’s mother Neetu is also very fond of Alia. So much so that she has called the ‘Brahmastra’ actress her ‘heartbeat’. Some of the pictures featured Neetu and her granddaughter Samara. Amongst them was also a picture that had Alia and Ranbir in it. Ranbir’s sister Riddhima and her husband Bharat Sahni were also a part of the pictures. Alia Kapoor had rung in New Years’ eve with celebrations alongside Kapoor family in New York, where the family is currently residing for Rishi’s treatment purpose. Earlier this sparked rumours that the veteran actor might be suffering from cancer.